The head measures 5.5 by 5 centimeters and has carefully executed features, including glossy black tresses combed back from a headband painted in yellow and black and a manicured beard of similar style and color as the hairdo. The tint of the skin is light green. The almond-shaped eyes and the pupils are lined with black and the pursed lips lend the figure a look that is part pensive, part stern. 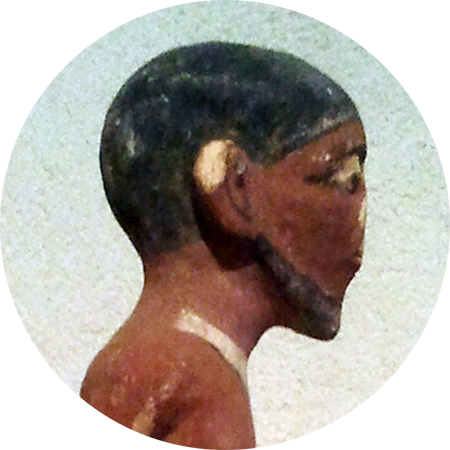 The tip of the nose and the beard are broken, and it is difficult to say whether the head was broken off at the neck. This is an important question, as it would indicate whether the head was part of a larger figure. . . .
To date, the object remains one of a kind. There are no exact parallels. Other bearded male heads are known in the Iron Age, but these are usually made of clay and are very crude. None are naturalistic like [this] figure. Several contemporary bearded male heads made of faience were found in the north of Israel, in sites such as Tel Dan and Tel Yokn’am. However, these are of different styles and none resembles [this] head in style or quality. 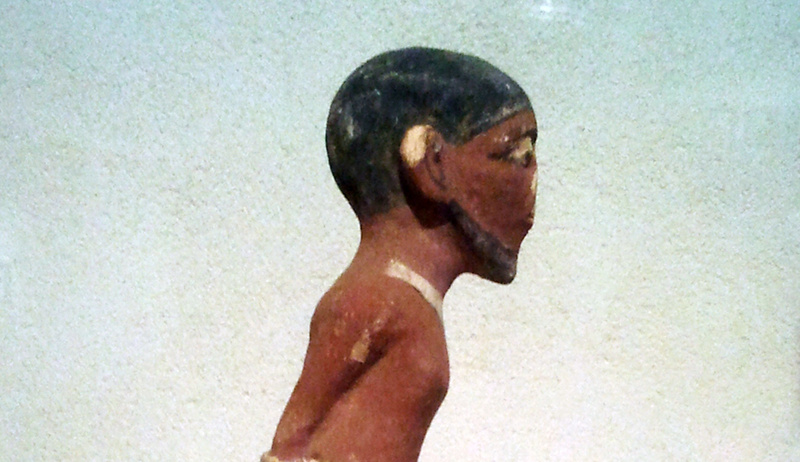 Its naturalistic depiction raises the possibility that a specific individual is being portrayed, but the figure could also very well be a general depiction of how the Egyptians viewed Asiatics, including Canaanites and Israelites—bearded and wearing a striped head band—particularly during the Ramesside period. . . . But unless the head was an heirloom from Ramesside Egypt, [making it] some 300 years earlier than the archaeological context in which it was found, its origin should be sought closer at hand. . . .
Whatever the origin, the question remains of why it was produced. The tidy hairdo with the concealed ears and . . . the high craftsmanship and uniqueness of the object indicate that the head was specially made for something or for someone. Was this the head of a royal figure or a dignitary? And if so, could we be staring at the face of a historical figure from the 9th century BCE?